This is a bit of a jump, I had originally planned to concentrate on the upper part of the topology, but this is just a quick post, as I set up a core component – the Active Directory server. This will be needed for authenticating to devices, website access through proxy rules, and a whole bunch of other stuff. One of the things I love about UNetLab is that you can create a folder, chuck in a cdrom.iso file, create a harddisk, and it will install (OK, for the most-part. Windows 10 doesn’t seem happy yet) – but I can quickly roll out my Active Directory server. drwxr-xr-x  2 root root 4.0K Aug 13 09:58 .
drwxr-xr-x 36 root root 4.0K Aug 13 09:49 ..
You don’t magically get the ISO file once you create the folder, I copied it over using FileZilla. Renamed it to cdrom.iso, created a 40G harddisk, and ran the wrapper. I have given this server, which will be my primary AD box the IP address 192.168.10.13, which means that I have also added another component to my internal network structure – the 192.168.10.0/24 network. So why did I use this particular address? Well, it’s a geek thing – if you can work it out then you win 10 points*. OK, so now let’s add this bit of the network (VLAN 10) to the switches. 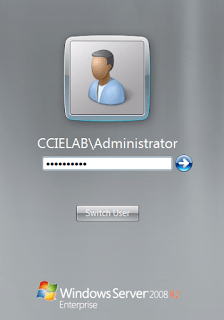 Domain name already set to CCIELAB. What we need now, in the words of my children, is some peoples to play with. Within my Active Directory I will need at least two user accounts and two security groups. UserA will be an admin for all things, he’ll have access to the routers and ASAs, the switches, all the websites, and everything you can think of. UserA will be in the Admins group. UserB will not have the same level of access, it will have access to one website, but not another – still not sure where these websites will be, exactly, but we’ll cross that bridge when we come to it. UserB won’t have admin access to the routers, ASAs etc, and I am sure I can find some other ways to be Captain Buzzkill for this imaginary user! Scripting is a bit more interesting than screenshots, it also makes it easier to cut and paste if you are following along at home. dsadd ou "ou=Staff, dc=CCIELAB, dc=local"
dsadd user "cn=UserA, ou=Staff, dc=CCIELAB, dc=local"
dsadd user "cn=UserB, ou=Staff, dc=CCIELAB, dc=local"
dsadd ou "ou=RBAC, dc=CCIELAB, dc=local"
Although I do seem to be jumping around the topology a tad, this was more of a side-step. But doing quick things like this earlier on will allow a more rapid approach later. It also helps me plan how the network will run, from both the top-down (IP addressing) and bottom-up (services and integration). I hope. That’s the plan at least. All points awarded on 802101.com are purely for entertainment value and do not represent any physical currency. They can be redeemed against an odd assortment of things I might have laying around, or I’ll buy you a drink if I happen to bump into you. Studying for CCIE Security? Buy this ISE book! But what if you already have Windows 7 or XP in your Windows Directory ? It is not detecting WIN-2008 folder when i try to add Windows Device ? am i missing something here ? What do you have under /opt/unetlab/addons/qemu/ ? 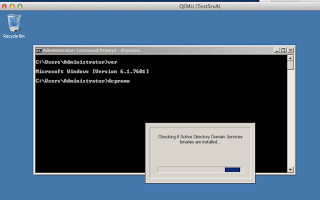 Have you actually added a windows server qemu image? If so, have you run the wrapper? That was fine, actually issue resolved when i renamed the folder from "Win" to "win" which means caps-lock matters in UNL 🙂 Nice Article though !